Hog Drives of Frio Canyon Texas. The blood lines on these hogs proved to be as interesting as the hogs themselves. Most were a cross between domestic “listed” hogs, better knows as “Hampshire”, and the imported European’s, commonly called Russian hogs. The settlers ran their animals on open range and as a result many of the hogs just went feral. Round-up time was very interesting to say the least! The composition of the hog drives was much like that of the cattle drives of old. Each rancher would spend several weeks gathering their hogs. They drove these hogs to Maverick Camp and East Pasture. Then they gave the drover the number of head that they put in the pens. 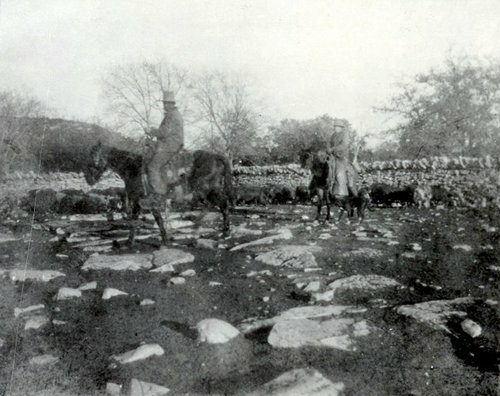 The drover recorded the total number of rancher’s hogs and then released them into the holding pen with the rest to await the drive to Kerrville. At the end of the drive the rancher collected money for the number of hogs that he released into the holding pasture. The hogs would feed on the acorns and continue to fatten until the drovers had enough gathered and were ready to hit the trail for the rail road some sixty-five miles away. “Enough” would equal several thousand hogs. Jake Haby, a descendent of one of the drovers, said, “As the story goes… when they hit the trail with the pigs you could see hogs from one horizon to the other.” Now that folks, is a lot of little porkers. 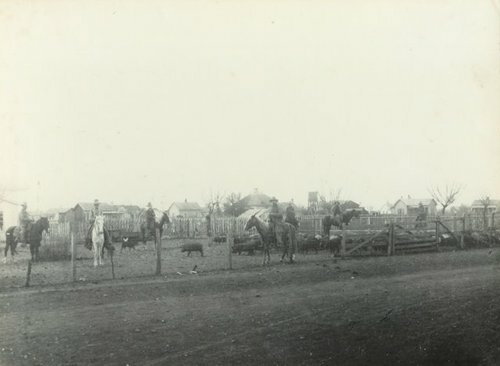 Alec Auld and about ten to fifteen other men made up the drovers. Some of the names included: William Putum, Whittum Holmes, Fred Large, Walter Large, Luke Large, Drew Large, Jeff Thompson, Dave Huffmon, Pete Lowrance, Bud Lowrance, Callie Bell and Holmes Ferguson. Along with the drovers there would be a chuck wagon and a couple of corn wagons. And we must not leave out the dogs as they played an important roll in moving the pigs along. One drover owned about ten to fifteen hog dogs. These dogs were probably hound crosses. The dogs would intimidate the hogs until the hogs would relent. The hog dogs had to be quick, agile and fearless. I am quite sure that several dogs probably lost their lives trying to control these aggressive pigs. The hogs, when on the fight, would attack man, horse or dog. 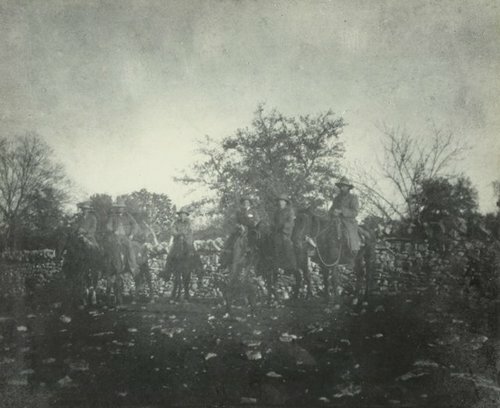 As the ranchers came upon these wild hogs during the year they would rope, castrate or spay them in order to control the population and make them easier to fatten and drive later. Most of the ranchers would rope the hogs but not Alec Auld. He would run into the herd on foot, grab a hog by the hind leg and take it to the ground. Other ranchers kept telling him that one day one of the hogs would get him and sure enough one day David Huffman came upon Alec sewing up his arm with a spaying needle. As Alec grabbed for a hind leg the hog turned and a well aimed tusk ripped a gash in his arm. 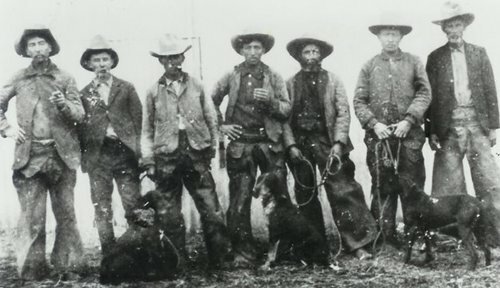 Besides good dogs, each drover had to have a pair of durable leggins’. The leather had to be extra heavy duty, strong enough to resist the bite or slash of a nasty boar. The leggins’, as we call them in this part of the world-you may correctly call them chaps, needed to have a special alteration. Most leggins’ are buckled in the front with a belt like piece of leather. The smart cowboy removes the buckle and replaces it with a heavy string, one that would break should a bucking horse cause the top of the leggins’ to hang up on the saddle horn. Keep this thought in mind for a future story. The ranchers found the hog business to be quite lucrative it was actually more lucrative than anything else that they did. They could make three to five cents a pound for the critters. All good things usually come to and end and so did the hog drives. The weevil that hit the acorn crops proved to be the demise of this business. This weevil would burrow into the acorns and eat the meat. The wild hog market soon fell by the wayside. But since these little porkers can produce three litters a year, they began to replace the acorns with rancher’s sheep, goats. To this day, they can literally wreck havoc every where they go. Hunting hogs soon became a popular sport which continues today. Sport hunters do it for the thrill of the hunt, ranchers do it out of necessity. The January column will feature stories of the hog hunters. Part I "Git Along Little Piggy"